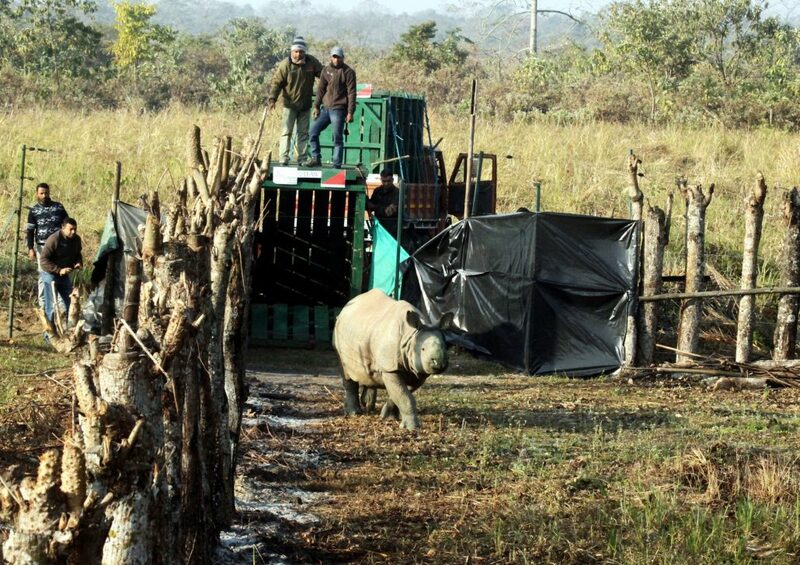 Two rhino calves were translocated to Manas National Park in western Assam on Tuesday by Assam Forest Department with the help of prominent wildlife NGOs. The translocation of rhinos is aimed at rejuvenating the population of one-horned rhinoceros in picturesque Manas National Park located at the foothills of Bhutan. The two rhino calves that were shifted to Manas Park, had been rescued from Bagori Range of Kaziranga National Park during the flood fury in the year 2016. One of the calves is male and the other is female. Both the rescued calves have been hand-raised by veterinary doctor and the staff at the Centre for Wildlife Rehabilitation and Conservation (CWRC) at Borjuri near Kaziranga National Park. The CWRC, a renowned wildlife care facility, is jointly run by Assam Forest Department and Wildlife Trust of India (WTI) with support of IFAW. These two rhino calves were released in the pre-release Boma of Manas National Park on Tuesday by the forest and NGO experts. The calves will be kept inside the Boma for two years to help them get acclimatised with the new environment there under protection. According to Manas National Park authority, the rhino population increased to thirty eight in the park on Tuesday with the introduction of these two calves. Rhino population in Manas Park dwindled to minimum during the troubled days of militancy in Bodoland areas of the state when the park had became a hotbed of militancy. As the situation has been restored to normal, efforts are being taken to restore the rhino population there. Some rhinos were translocated to Manas Park from Kaziranga National Park and Pabitora Wildlife Sanctuary earlier under the Rhino Vision 2020. Kaziranga National Park in Assam is called the abode of Indian Rhinoceros. The UNESCO World Heritage Site hosts over 2413 one-horned rhinoceros as per the headcount carried out in the year 2017.